OTTAWA -- Conservative Leader Andrew Scheer marked the start of the one-year countdown to the 2019 election with a campaign-style speech that took direct aim at the Liberal government's record -- on everything from carbon taxes, to ethics, to budgetary deficits. Scheer even did an impression of the man he succeeded as leader of the Tories -- former prime minister Stephen Harper -- as he criticized the Trudeau government's handling of the federal finances. "Remember those? Remember those teeny, tiny temporary deficits?" a smiling Scheer said Sunday inside an Ottawa convention centre as he held up his right thumb and index finger for the laughing crowd of party supporters. Scheer was referring to the Liberals' 2015 pledge to run annual shortfalls of no more than $10 billion and to balance the books by 2019. After winning power from Harper, Prime Minister Justin Trudeau abandoned the vow, citing a weaker-than-expected economy and a need to invest in the country's long-term growth. The Liberals produced a shortfall of $19 billion last year and have yet to provide a timetable to return to balanced books, despite the stronger economy. The deficits are expected to be central to the Tory attacks in the lead up to the next election on Oct. 21, 2019. Back in 2015, Harper frequently targeted Trudeau's deficit promise while he was on the campaign trail. Harper, widely known for being serious, made a bit of a splash with meme-makers on social media when he made a similar teeny-weeny hand gesture about the Liberals' shortfall pledge. "He'll run, he says, a modest deficit, a tiny deficit -- so small you can hardly see the deficit," a sarcastic, hunched-over Harper said of Trudeau at the time. In his speech Sunday, Scheer ran through a list of other areas where he believes the Liberals have vulnerabilities. He focused on the Liberals' centrepiece carbon tax plan -- which he called a "revenue plan" to fill government coffers -- and on the ethical issues that have led to reprimands from the federal ethics commissioner. Scheer noted how the ethics commissioner ruled Trudeau himself had contravened the Conflict of Interest Act in relation to his vacation on a private island in the Bahamas owned by the Aga Khan. He also pointed to the failed Energy East pipeline that was to transport crude east from Alberta -- a project he vowed to revive, if elected -- as well as an updated North American trade agreement he argued failed to bring any gains for Canada. In the "one-year sprint to the finish," Scheer told his supporter the Liberals will throw everything they have at the Tories. "It's going get worse, it's going to get nasty," said Scheer, who insisted Trudeau also has the news media and pundits on his side. Recent polls have suggested the Liberals are in a relatively good position ahead of the Tories and the NDP -- but a lot can change in 12 months. The Tories have enjoyed bursts of momentum in recent months. First, the Conservatives won a key byelection in the Saguenay region of Quebec, a province that will be a critical battleground ahead of next year's vote. Last month, former Liberal MP Leona Alleslev stunned colleagues by announcing she would cross the floor from the governing party to join their Tory rivals. "I may be a little late to the party -- but better late, hopefully, than never," Alleslev told the crowd Sunday before Scheer took the stage. 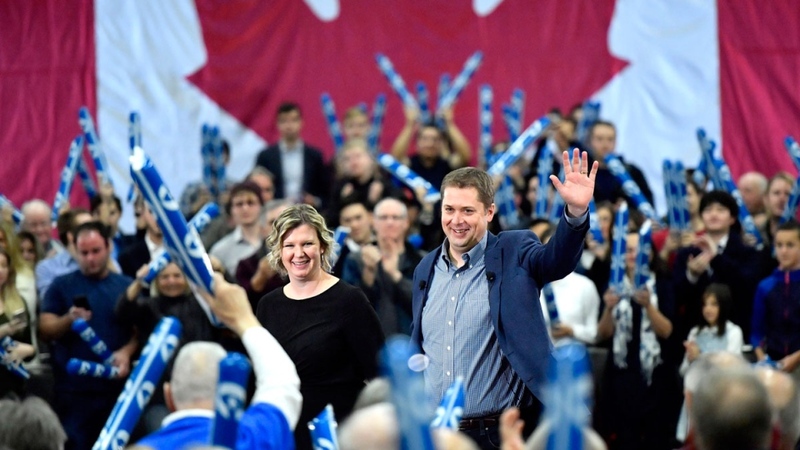 In his speech, Scheer also underlined the encouraging emergence of new conservative governments in the provinces, including the two biggest ones: Ontario and Quebec. "We've got more and more allies in premiers' offices across the country who will help us implement our vision of low taxes, smaller government and greater individual freedom for Canadians from coast to coast," he said. The Conservatives, however, have also suffered setbacks. Maxime Bernier -- one of Scheer's rivals for the Tory leadership -- left the party in the summer and called his former leader and colleagues "intellectually and morally corrupt" on his way out the door. The Quebec MP later launched his own federal conservative political party. Bernier's move angered Conservatives, who have argued that adding another party on the right side of the political spectrum will split the vote and allow the Liberals to easily win another majority government.